It is a reality today that kids have many opportunities to play sports and very few youth athletic organizations provide sport-specific safety training for the athletes. Approximately 3.5 million kids are treated for sports injuries each year (Safe Kids USA) and nearly half of those injuries are considered overuse injuries (back, neck, shoulder muscle sprains and strains). As parents, we depend on our coaches to keep our kids safe. In many cases, our children can feel pressure to not let their team or their coach down and will continue to play when their bodies are telling them to stop. Often times it is our kids who need to know how much is too much. Mobility, flexibility, balance, strength, coordination and neuromuscular control are all important factors in preventing overuse injuries. Chain Reflex® offers training strategies for young athletes utilizing functional movement techniques and education. 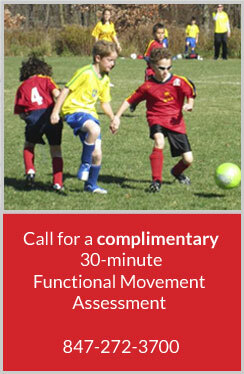 Dr. Daryl is experienced in pediatrics and is a certified movement specialist. He is also a former competitive athlete and has a son who is involved in sports. He understands the need for kids to be educated at an early age about how protect themselves from injury. Dr. Daryl is offering a free 30 minute functional assessment of your child to see if Chain Reflex® is right for you, and for them.